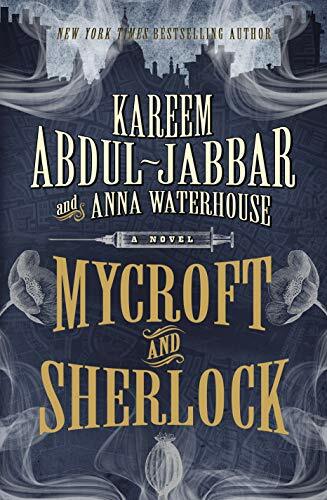 In Mycroft and Sherlock, authors Kareem Abdul-Jabbar and Anna Waterhouse bring an awareness of the relationship between two brothers that is not seen in the original Sherlock Holmes series. Sherlock is an irascible, young, 18-year-old college student who has little time for studies or following the direction of his old brother, Mycroft. He prefers to pursue exciting puzzles. The story opens with a series of gruesome murders of Chinese men. When another similar murder occurs, but the victim is a white man, more attention is drawn to the crimes. Abdul-Jabbar and Waterhouse bring in another character, Cyrus Douglas. Douglas is Mycroft’s best and most trusted friend who owns a home/school for wayward boys: Nickolaus House. In an attempt to corral Sherlock’s difficult ways, Mycroft asks Douglas to allow Sherlock to teach at the school. Reluctance on the part of both Douglas and Sherlock, the tide quickly turns when one of the boys disappears, and after an exciting search, the boy is found nearly dead. When the child dies later that evening, clues lead Douglas, Sherlock, and Mycroft to pursue the murderers. Unbeknown to Douglas and Mycroft, Sherlock employs his own characteristic skills of deduction and hunts in one direction while Douglas and Mycroft follow their own scent of clues. Mycroft uses his connections in high places, while Douglas follows a path of clues through lower, edgy London. All three men begin to arrive at the same place with the same discoveries and outcomes. A new drug has been discovered, and although not being brought into England, it is prepared and shipped out of London. But it must be tested, and young street urchins are the most disposable commodities to the drug dealers. Sherlock, the first to discover the dealers, attempts to infiltrate the gang, but is used as a tester of drugs as he disappears through a fog of drug experiences. In the meantime, Mycroft is bewitched by a beautiful Chinese woman who invites Mycroft and Sherlock to her home for dinner. Mycroft accepts on behalf of both men, still unaware of the dangerous position Sherlock has placed himself in. As Sherlock emerges from this drug-induced fog, he returns home to learn of the dinner invitation. He does not care to attend, but has no choice, since Mycroft directs so much of his life. Once at the dinner, the men learn of a plot to murder the woman’s father who is mysteriously associated with the drug dealers. When the woman is called away from the dinner, Mycroft believes she has been called away as a ruse to get her and her brother out of the house, while others enter and murder her father. Mycroft calls on Douglas to keep watch on the house while the others follow the trail, where they discover a wealthy matron and friend of the Chinese woman, has been murdered. As they realize the ruse was to get them away, they rush back to the house just as Douglas and Mycroft’s man, Huan, are fighting off the intruders. The father is saved, and makes a startling confession. Abdul-Jabbar and Waterhouse do a fine job of introducing other characters previously identified by Doyle in the original series. Their use of the vernacular to keep the reader in the Victorian era is well done, and much in keeping with Doyle. The most interesting part of the story is how they intertwine these three characters throughout the plot, giving each his own personality, strengths, and weaknesses. The reader is introduced to a budding character in Sherlock, before his skills are fully developed, but as he is influenced by his brother’s own characteristics. The character of Cyrus Douglas is given an intricate role to play in resolving the murders and the drug trade. He and Mycroft play off of the strengths of each other with good results, while each also plays a role in directing Sherlock’s life. Mycroft and Sherlock has a well laid out plot with many twists and turns that will keep the reader guessing. And for Sherlock Holmes fans, it is a perfect edition to sit next to Conan Doyle on the library shelf.